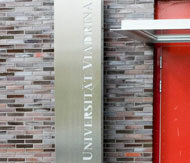 Welcome to the pages of Viadrina Mentoring for female students. Here, you will find information on our offers concerning your professional orientation and planning. Your graduation and thus questions concerning your professional future are approaching? What are my qualifications and competencies? Where and how can I put my expert knowledge into practice in a meaningful way? Is a PhD an option for me and will I succeed even if I am the first person in my family who studied? What perspectives will open up for me through that? What are arguments for or against university or extramural career? What characterizes a scientist today and is being a scientist an actual profession? How can I get access to career-relevant networks? And where is room for a/ my family in this? Questions like these are legitimate and a safe space is needed in order to enable satisfying answers. 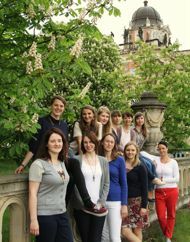 Through Viadrina Mentoring, the European University Viadrina offers a programme that supports female students in their professional orientation and their consideration of doing a PhD in a structured and professional way.